These are samples of silhouettes, cut live at events. Each takes about 2 minutes to cut, then they are pasted to a customized-to-your-party backing card. Silhouettes are elegant linear likenesses of the human profile ...simple yet stunning to watch being created from thin air! This is how people commemorated their loved ones' faces before photography if they could not afford a painter. 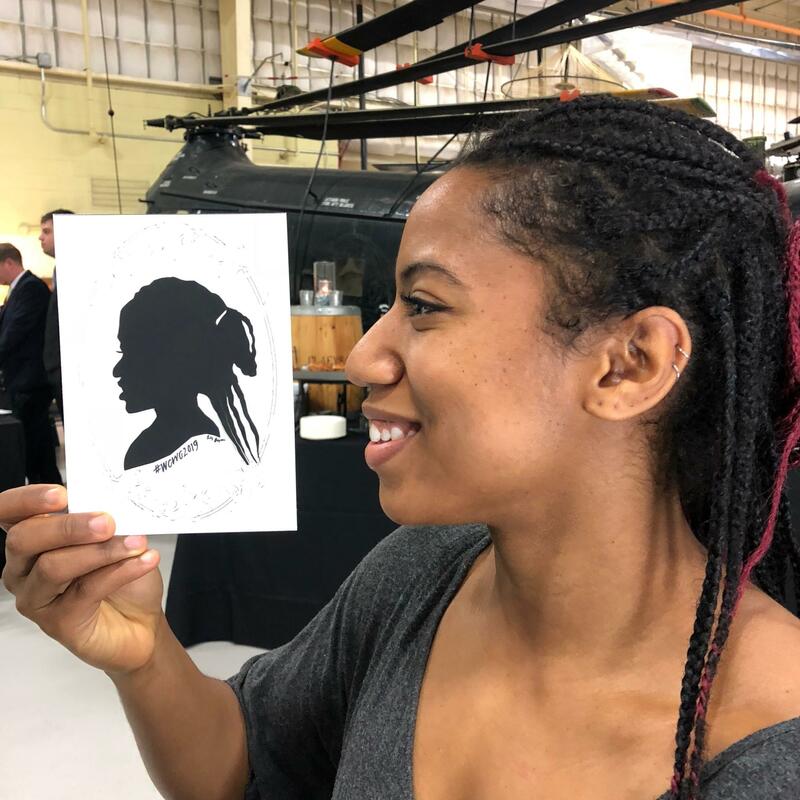 There are very, very few practitoners today who cut silhouettes in the traditional way (without drawing first, or using a light to make a shadow)...just observing, then snipping, as Emily does! How many silhouettes can you cut in an hour? 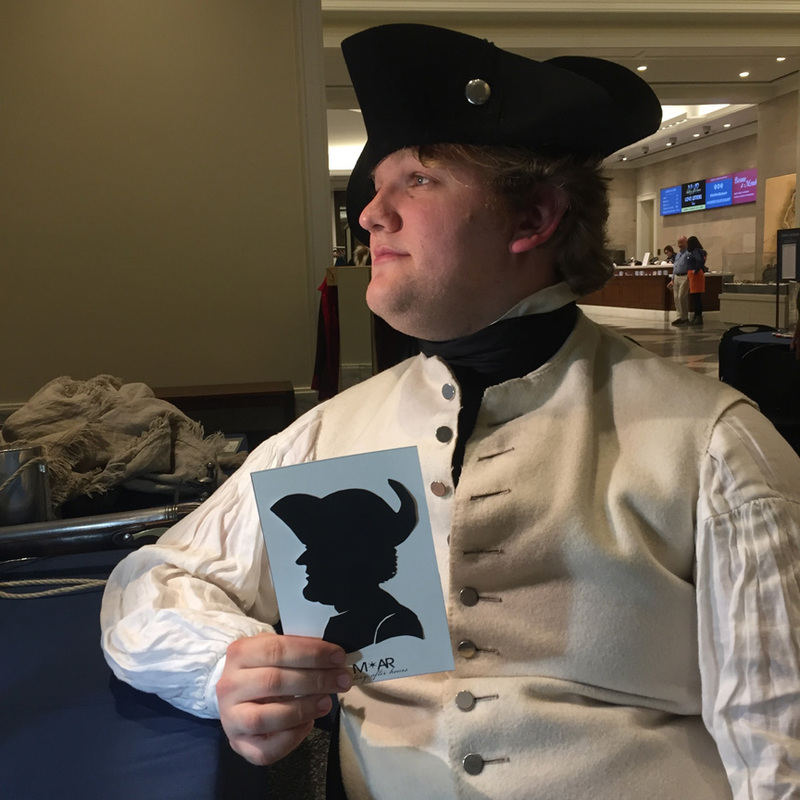 I like to cut around eighteen to twenty profiles per hour, that way I have a few minutes to converse with each person as I cut and then paste their silhouette to a customized-for-your-party backing card. Do they have to sit absolutely still? No, I do it glimpse by glimpse, in around two minutes per face. This works out wonderfully for squirmy kids! What kind of space do you need to set up? I ask the client to provide a small table, (card-table size is good, it can be a little smaller than that if need be, or it can be part of a longer table) at least two same-height chairs, and access to electricity for my light. If you can provide a small trash receptacle, that helps...there will be small snippets of paper on the floor. What size paper do you use? My silhouettes fit on 5 x 7 cards that I provide. These can be custom-printed with your party name and date, OR I can write out each one in calligraphy beforehand. OR you may provide them if you wish! Do you offer frames or mats? No, too much to carry and it's such a personal choice. How many hours can you cut silhouettes? Do you take breaks? Currently the longest period of time I've done sustained silhouette cutting is four hours straight. I only take breaks if absolutely necessary, so as to get the maximum number done that I can do at your event. How do you deal with lines? Generally, the best way is first-come, first-serve. Sign-in sheets don't work as well as you would think, as time is wasted looking for the next person if they wander off. The beauty of live silhouettes is that it entertains many while they are waiting to be cut---AND it's so quick, that the line moves swiftly. My scheduled time is posted on a sign next to me so people will know when I am finished. If I am asked to stay longer, I note that on my sign, too. 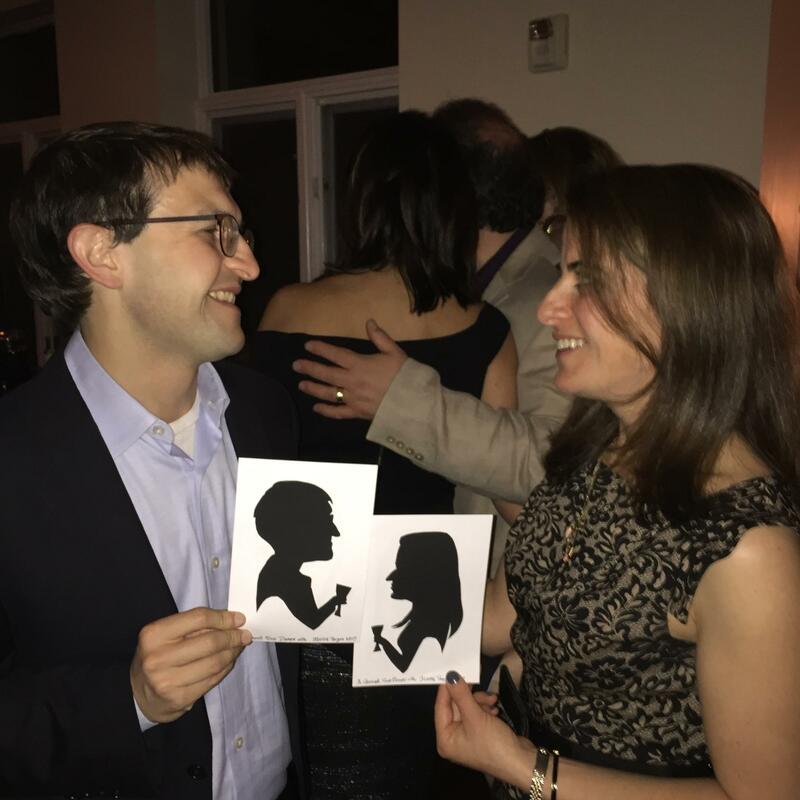 How did you get started cutting silhouettes? As a longtime professional caricaturist, I am passionate about portraits in any form. 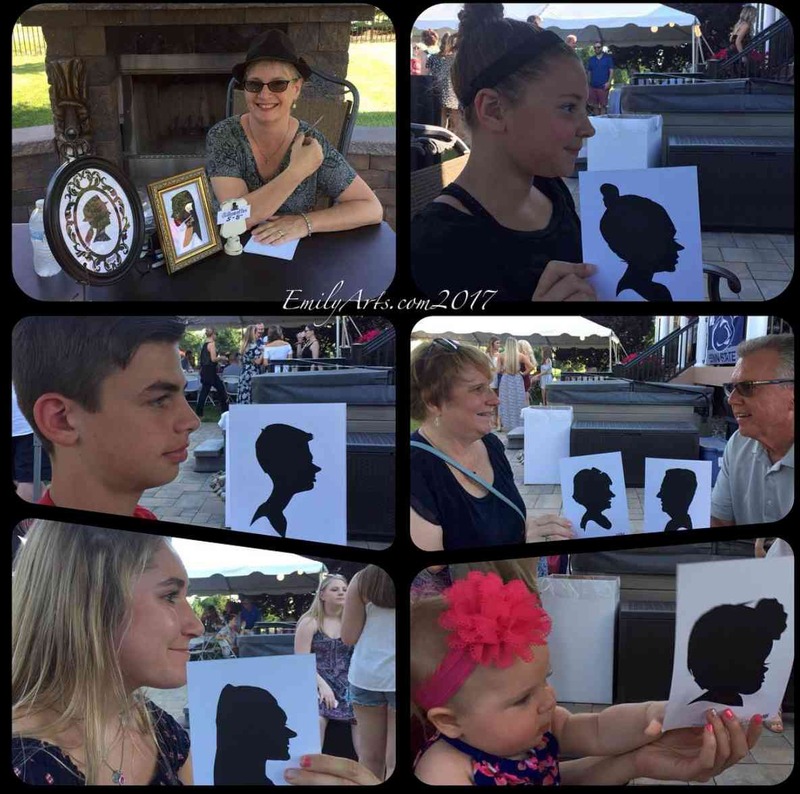 So when I attended two caricaturist conventions in 2014 (one in The Netherlands and other in Reno, Nevada---which were attended by, firstly, a Dutch lady silhouettist, and then a Californian gentleman silhouettist) I was intrigued and attracted to the art form. 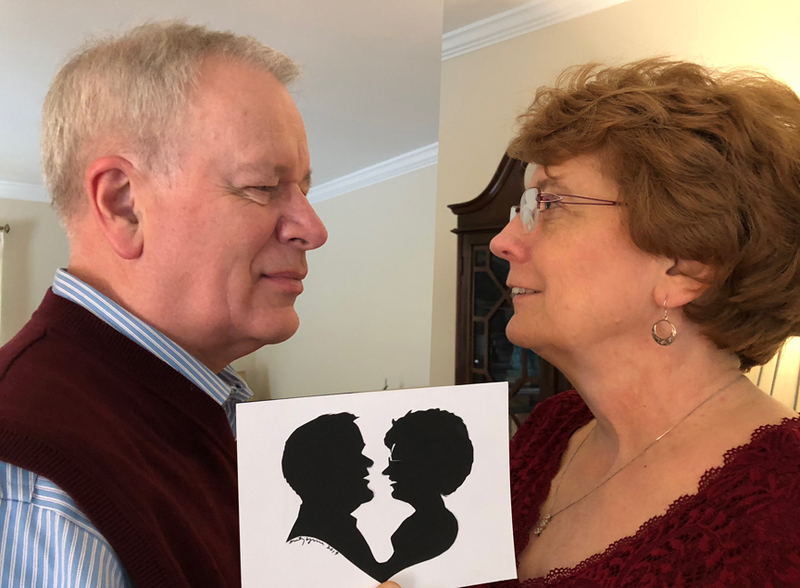 My observational skills were already honed from years of experience as a caricaturist, so it was just a matter of learning to cut intricately, accurately, and quickly! 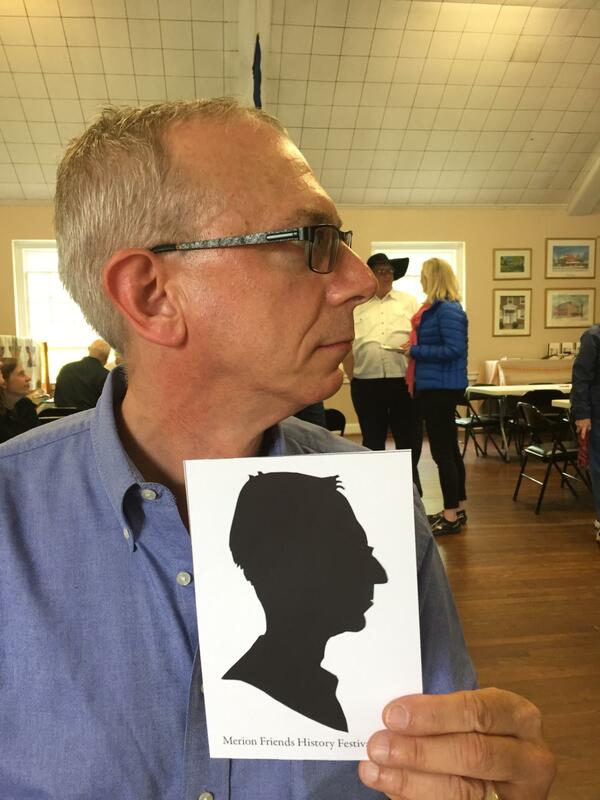 I also sought out silhouette artists in social media to learn from, and am extremely inspired by this British master of the craft, who wrote a book and filmed a documentary on the subject.. I'd like to book you for my event. What do I do now? Once you've emailed me for availability, I send a simple contract that lists the particulars of your party--client name, contact info, date, time, event location, and anything you'd like me to keep in mind (such as whether the event is a surprise, if there is a theme, what you'd like written on each backing sheet, any special directions, etc.). I require a nonrefundable 1/3 deposit to hold your date for you (once I receive it, I turn down all other requests for my services.) If by some circumstance, I cannot do your event, I refund your deposit--but I have never had to do that in the twenty years I have done events. Then I join you on your happy day and start snipping! 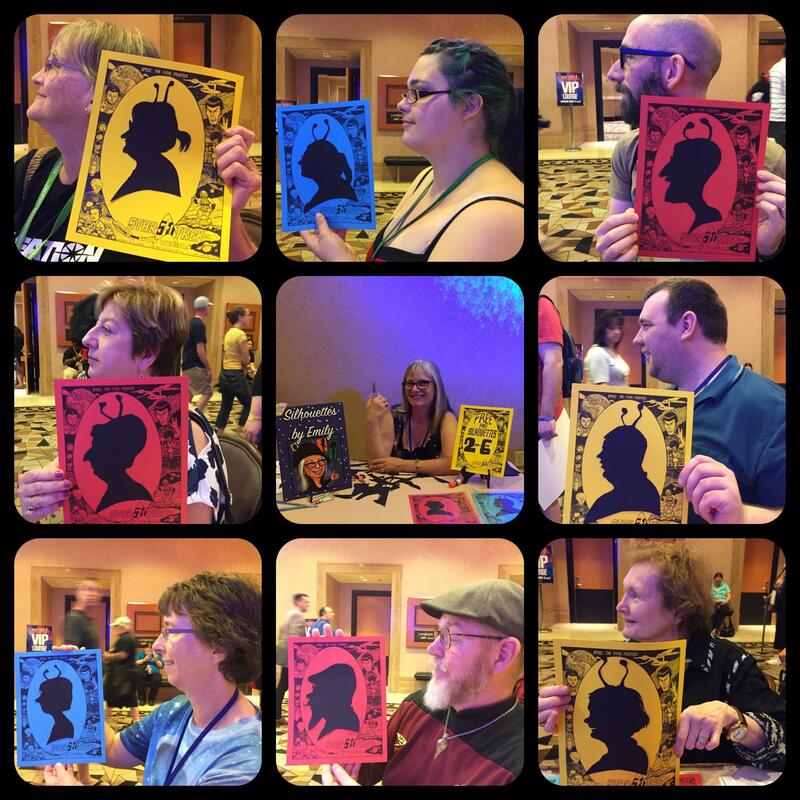 Silhouettes cut by Emily at the 2016 Official Star Trek convention at the Rio in Las Vegas, Nevada! 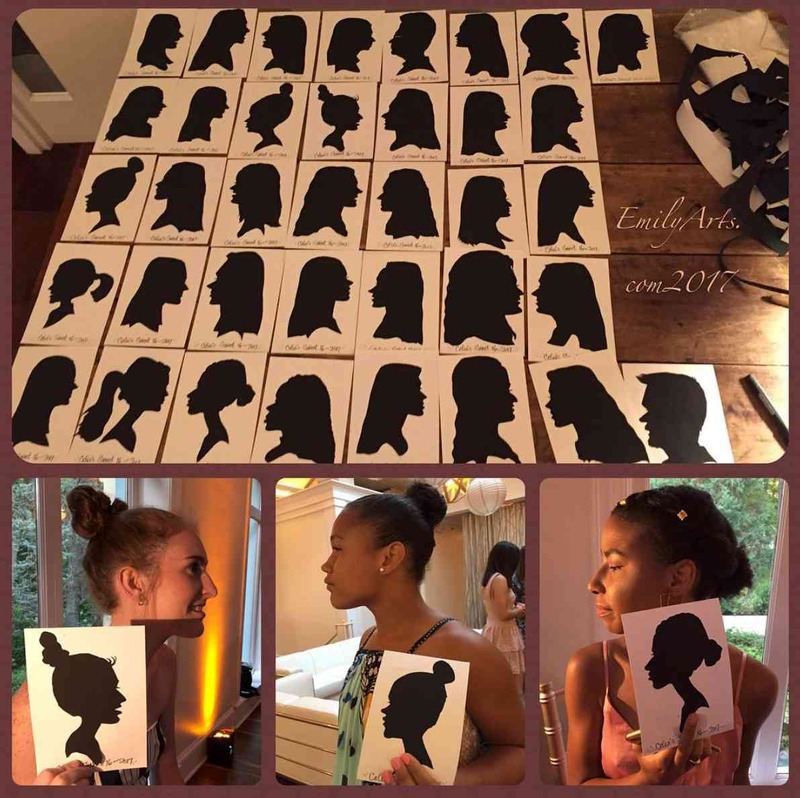 Silhouettes cut in two hours at a Sweet 16 party.